The expert system for production optimization. The key to greater transparency and productivity in machining. The ratio between input and output – or productivity – is one of the most important reference values within a company. But what is the actual situation? Where can improvements begin to be made? What are the relevant influencing factors and parameters? How can the complex relationships you deal with on a daily basis become transparent? What will actually be achieved as a result of actions taken? Will the outcomes be replicable, measureable, improvements? Or might actions sub-optimize processes if success in one area is attained at the expense of performance in another? Comara sysCut PES (Process Executing System) from Comara is a software solution that helps you answer these questions. 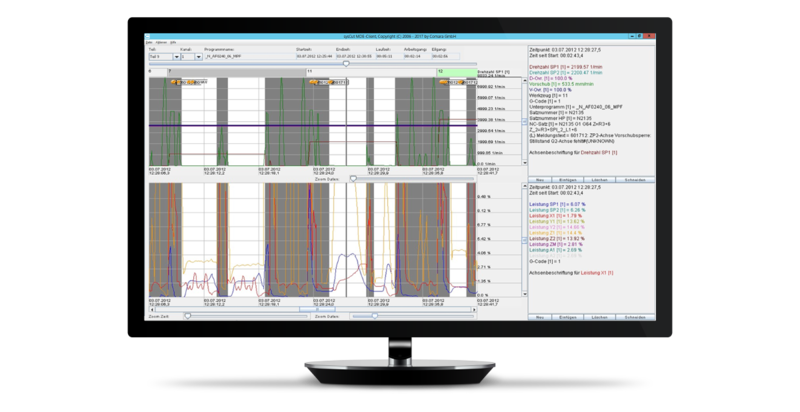 Comara sysCut facilitates the automatic acquisition and structuring of process data from machining. With direct access to CNC controls that supply data, a comprehensive amount of information – ranging from an enterprise-wide perspective on an abstract level to detailed views of individual machines and tools – is tapped and made available to the right place in the company. This improves transparency, control and cooperation within the company along the entire value chain. Tool centric analysis of processing peaks, potential for optimization, wear and tear and process reliability can be performed at the push of a button with Comara sysCut, thereby helping to cut production start-up times considerably (programming, setup, producing). Want to know more? Write to us!